Much has transpired since I sent out my last newsletter early in December. I’ve spent time in Phuket and Krabi (Thailand), Penang, Kuala Lumpur, and Port Dickson (Malaysia), Sulawesi and Bali (both in Indonesia), then back to Bangkok and Chiang Mai (Thailand). I’ll not try to recount all of the significant events, experiences and achievements in these places, I’ll just say that I live a very blessed and interesting life. If you’d like to see pictures, you can visit my Photo Gallery at http://picasaweb.google.com/tomazhg. In Thailand, there is no such thing as unemployment insurance, and old age benefits provided by the government are so tiny as to be insignificant. That means that Thais need to be enterprising and supportive of one another to a greater extent than westerners. Besides that, Thais seem to have a greater connection to family and friends in the countryside who still have access to land, which makes me think that they will have an easier time adapting to the adverse economic conditions that appear to be on the horizon. Pa is an entrepreneur. She has a juice stand which she sets up amongst a score of other food vendors every afternoon for the night market. Many of her customers are regulars. Split about half and half between Thai and farang (foreigner), they come back to her again and again, not only because she makes the best smoothies and shakes, but because she is a bright spirit, happy and congenial. She truly enjoys her work, and that draws people like a magnet. There is a kind of community amongst the vendors who operate there just outside the gate to the old city. It is a community that includes not only the vendors, but a goodly number of regular customers, as well. The vendors all know and help each other out in various ways, tending each other’s stands whenever it is necessary to run a short errand, or lending a han d when business is brisk. Each vendor has a wheeled cart that is kept somewhere else in the off hours. They are brought to the market site in late afternoon, then wheeled off again around midnight by other entrepreneurs who make a business of providing the service of moving carts back and forth. All of these people work very hard for little reward. 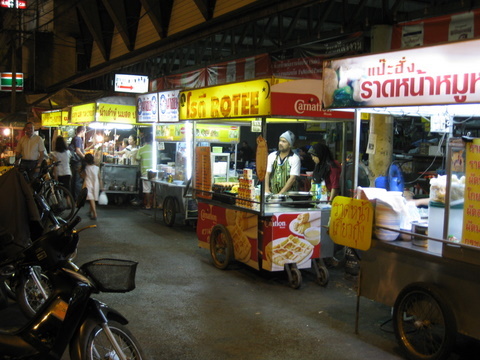 Their prices seem absurdly low by western standards and in comparison to most of the local restaurants that cater to tourists—a fresh fruit shake for about half a U.S. dollar, a cup of fresh ginger tea for about 17 cents, a plate of pad thai noodles with chicken for less than a dollar. The low overhead expense of operating a street stall is a major factor that makes these businesses viable. What makes their prices seem cheap to us of course hinges upon the exchange rates between the Thai baht and the currencies that tourists bring from home—dollars, euros, pounds, yen, etc. These foreign exchange rates are determined by mechanisms that seem to defy logic, and that few people understand. They are supposedly determined by what is touted as free trading (buying and selling) in the currency markets, but it is no secret that these markets are manipulated by central banks and big traders. In fact, the central banks of the various countries have a mandate to “manage” the value of their currencies. One has to wonder, what is the difference between “management” and “manipulation” and for whose benefit is it done? Pa’s day begins early and ends late. I accompanied her a few times to see what her business entails. 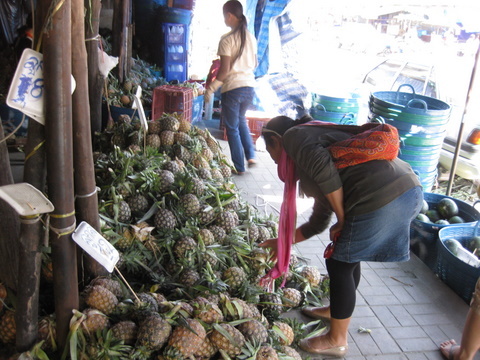 It starts in the late morning with a trip to the market to buy the fresh fruit ingredients needed for the evening’s business—papaya, pineapple, mango, watermelon, banana, apples, etc., and a separate trip to a roadside stand to collect a supply of the sweetest strawberries I’ve ever tasted. Then it’s off to the place where her cart is kept during the off hours where she washes the fruit and prepares for the evening’s business. The vendor carts get put in place around 4 in the afternoon and customers start coming around 5. It’s a pleasant experience to join the bustle of activity as the dinner hour wears on and waves of customers arrive, place their orders, and sit down at the portable tables to enjoy the food, the conversation and people watching. By 10 or 11, vendors begin cleaning up and shutting down and getting ready to repeat the process again the next day. The myth of Bali probably far exceeds the reality. That is not to say that it’s not worth the visit, it is, but if one is envisioning scenes from the movie South Pacific, they are likely to be disappointed. On my two visits, which were three years apart, I’ve spent most of my time in Ubud, so my observations are extremely limited. There are probably some more remote areas that can provide a different experience, but my impression of Bali is that it has become too dependent upon tourism and is rapidly losing its authenticity. 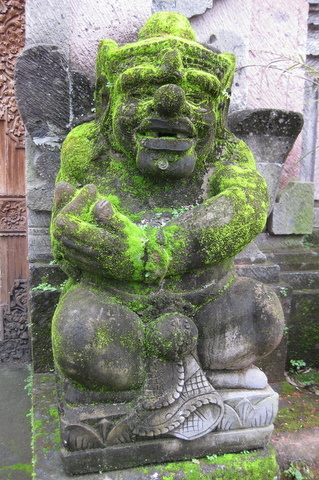 Ubud is purportedly the cultural center of the island, a claim that stands up pretty well. The whole place pretty much closes up around 10 or 11 at night. One notable thing about it is how quiet it is in the early morning hours. There are no late night discos blaring cacophonous sounds and heavy drum beats into the night, and traffic pretty much stops by midnight. The absence of mosques means that there are no artificially amplified “calls to prayers” rousing one from sleep at 4 a.m. as they do in Malaysia and other parts of Indonesia. The only sounds one hears are the insects buzzing in the trees, doves cooing, and the inevitable rooster crowing as dawn approaches. I take these sounds as God’s own call to prayer as s/he reminds us of the great mystery that is life, a mystery in which we all partake and are challenged to make good use of. I spent the last night of my Balinese visit in Kuta—not really long enough to understand the good, the bad, and the ugly of the place. I knew in advance of Kuta’s reputation as being very “touristy” and wide open. It clearly is the former, crowded with foreigners, traffic congested, and filled with trendy shops, but I can’t confirm the latter. 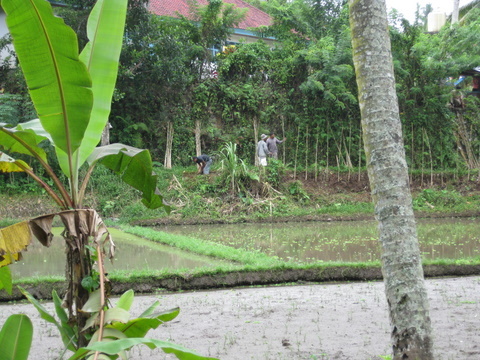 Although the two usually go together, Ubud seems to be the exception to that rule. I’ve spent enough time there to get a good sense of the place. There are plenty of tourists there and the town is dependent upon them, but any hanky-panky that goes on there must be deep underground. I was surprised to see so many family groups in Kuta. I found the beach there to be not at all inviting. The beach itself is far from the broad expanse of golden sand that one imagines of a tropical paradise, and the water was roiled by a heavy offshore wind (and probably other things that go with heavy concentrations of humans). I had some difficulty finding a place to stay in Kuta. The ones I tried were either too expensive or fully occupied. I did eventually find acceptable lodgings, and after a late check-in and much needed shower, I went in search of food and drink. The beachside restaurant I chose (Blue Ocean) saved the day. It turned out to have free Wi-Fi, pretty good food, and a fabulous band that played a lot of great tunes from the 70s and 80s. The mixed-age crowd included a “mature” couple whose jitterbug skills were a pleasure to watch. Here’s a clue to my persistent question of why people choose to vacation in places that are overrun with other tourists. What for me is a negative, is for them an attraction. Tourists want to be with other people who are like themselves in some place other than home, where they can let their hair down and party. One last thing about Indonesia, They get you coming and going–US$25 for your visa-on-arrival, and 150,000 Rupiah departure tax (about $17)on your way out—not a lot of money but annoying nonetheless. I’ve presented strong evidence in some of my recent blog posts (Inflation Will Destroy the Dollar) that we are on the verge of large price increases resulting from the US government fiscal crisis and massive inflation of the dollar (euphemistically referred to as “quantitative easing”). The last two years have already brought significant increases in the cost of living, despite government pronouncements to the contrary (Chris Martenson: Inflation Is So Much Worse Than We’re Told). Ordinary working people and retirees are being hit with a “double whammy” of stagnant or falling incomes along with an increased cost of living. In their phony political charade, the Republicans are pushing to give us more of the former, while the Democrats want to give us more of the latter—either way, the people lose, and ultimately we will get an increasing measure of BOTH. As the economic and financial picture worsens, people are getting more worried and looking for answers. I’m often asked for advice about how to invest and protect one’s savings. Financial advice is not my main interest but I can read the writing on the wall, and it seems certain that those who have any savings at all will see the purchasing power of their nest egg shrink badly over the next couple years. Investment advisors typically advise clients to choose amongst three basic investment objectives—income, growth, and capital preservation. In a depression, “cash is king,” but in an inflationary scenario, capital preservation becomes the be all and end all and holding dollar denominated securities, including bank balances and CDs, will not cut it. As I wrote in my latest book, The End of Money…, I think civilization is going through a metamorphic change. Making the shift away from the debt-based financial system and the growth imperative and to a sustainable, more equitable society requires that we learn radical sharing, cooperation, and organization. I have for a long time been arguing that we need to reorganize the exchange function to be decentralized and interest-free, and that we also need to reorganize the finance function. That means shifting our financial investments from Wall Street to Main Street and applying them to support community vitality, self-reliance, and the common good. In that vein it is remarkable to observe the emergent phenomenon known as “crowd sourcing.” While that approach has been variously applied, in the realm of finance it means gathering small amounts of investment money from a large number of sources. Interestingly, those investments are often in the form of donations rather than loans or ownership shares. People are increasingly demonstrating their willingness to put up money for things that may not benefit them financially, but that are seen to be in the public interest. Kickstarter.com is a well-know web platform on which entrepreneurs can showcase their projects and solicit funding. A more recent development that I am enthusiastic about goes even further in helping to organize support for emergent projects on an ongoing basis. It’s called CREW (Connect to Resources that Expand your World), and it’s avowed purpose is to “connect people to fund small business for the common good.” It’s not quite ready to “go public” yet, but as a member of the Founder’s Circle, I’ll soon be asking you to join CREW. Watch for it. I’ll be returning to the US soon, landing in Los Angeles on February 17. My plan is to remain in North America until the middle of June before going abroad again to continue active collaborations and to participate in conferences in Asia and Europe. I’ll head for Tucson shortly upon my return to rest up, see friends, and take care of some business there, then finalize plans for my North American tour (I have a few invitations pending and can consider others). Here’s wishing you all a happy and fulfilling year, and may 2011 bring greater peace, justice, and harmony to our world. This entry was posted in Economics, Geopolitics, My activities and tagged newsletter. Bookmark the permalink.